Further to the previous blog begging you all not to get freaked out by sourdough, I have had lots of requests for simple instructions about how to make and keep a sourdough starter. I have three sourdough starters on the go at any one time: white wheat, whole wheat, and rye. I don't have a spelt starter because a) I find it tricksy: at any given moment if I turn your back it just jumps up and pours itself all over the counter and the floor. Maybe it's just me, but I cannot be doing with such an independent creature in the kitchen and b) I find it makes bread that is rather bitter unless I add sugar or honey or some other thing to add sweetness and I don't necessarily want to do that all the time. Feel free to disagree and let us know. 1. Once you have mixed flour and water together (see quantities below) for four days, your starter should be frothy and/or bubbly. If it is not, just tuck it up and leave it for another 24 hours. After that if nothing at all is happening you can add a few grains of yeast to it and leave it for 24 hours but you should not have to do this. If nothing is happening naturally you have been using too much disinfectant and need to let your house get a bit more (normally) dirty! 2. To store your starter once it is frothy and bubbly, you put it in the fridge in a plastic container with an air tight lid or a kilner jar (the kind with the rubber sea). Do not use a regular jam jar because it may explode in a dangerous shower of glass shards. 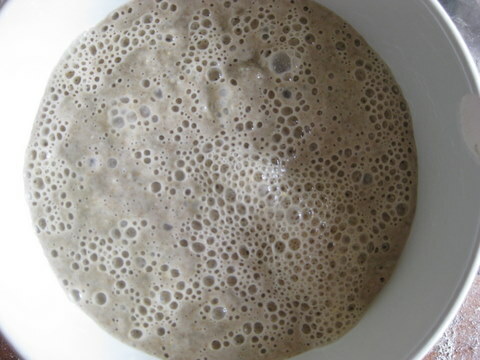 You will need a lot of space in your container especially for the first few days - the starter may continue to froth up. The worst that will happen in a kilner jar or a plastic tub is that it will leak through the seal and form a thick pool in your fridge! 3. You do not need to feed your starter slavishly every day. I once found some of the 1857 in the back of the fridge that had been there for about 5 years. I refreshed it and made bread. Good as new. Remember, sourdough was used by people who did not have access to commercial yeast - cowboys rolled it up in their bed rolls, pioneering women transported it in the back of covered waggons, families living on the steppes of Russia managed to keep theirs alive in spite of harsh siberian winters. You can freeze it, you can dry it, you can ignore it - it will always come back. a) If you are going to bake every day or every other day you may want to feed your starter every day. That way it is in a permanent state of being "refreshed" and you can usually cut out the step that says "The day before you want to make bread, refresh your sourdough". To feed your starter every day simply put it in a big container with a lid and put in as much as you took out. Sound odd? Not at all. Your starter will have the consistency of thick cream. When you make bread you take starter out of the pot to make the bread. Add flour and water to the starter - maintining the thick cream consistency. If you change flours you will have to change quantities because flours are all different. If your starter gets a little thin, add a bit more flour. If it gets a little thick, add more water. Use tepid water if you can - sourdough likes warm water. If you have not fed it in 4-5 days you will need to go through the refreshment cycle again. Just follow the instructions of the recipe you are using. b) Refresh the starter when you need it. If you do this always refresh more than you need so you have some to put back in the fridge for the next time you want to bake. To refresh the dough, follow the recipe instructions as there are lots of ways to refresh dough and different bread calls for different refreshment techniques. Mix 50 g white wheat flour and 50 g warm water together. Cover and put somewhere warm (airing cupboard, on a heated floor, sunny place) for 24 hours. Add 50 g white wheat flour and 50 g warm water to the Day 1. Mix. Cover and put somewhere warm. Add 50 g white wheat flour and 50 g warm water to the Day 2. Mix. Cover and put somewhere warm. Add 50 g white wheat flour and 50 g warm water to the Day 3. Mix. Cover and put somewhere warm. Voila. You have a viable white wheat starter. Mix 50 g whole wheat flour and 50 g warm water together. Cover and put somewhere warm (airing cupboard, on a heated floor, sunny place) for 24 hours. Add 50 g whole wheat flour and 50 g warm water to the Day 1. Mix. Cover and put somewhere warm. Add 50 g whole wheat flour and 50 g warm water to the Day 2. Mix. Cover and put somewhere warm. Add 50 g whole wheat flour and 50 g warm water to the Day 3. Mix. Cover and put somewhere warm. Voila. You have a viable whole wheat starter. Mix 25 g whole rye flour and 50 g warm water together. Cover and put somewhere warm (airing cupboard, on a heated floor, sunny place) for 24 hours. Add 25 g whole rye flour and 50 g warm water to the Day 1. Mix. Cover and put somewhere warm. Add 25 g whole rye flour and 50 g warm waterto the Day 2. Mix. Cover and put somewhere warm. Add 25 g whole rye flour and 50 g warm water to the Day 3. Mix. Cover and put somewhere warm. Voila. You have a viable rye starter. And now you can bake. As a final final note, a lot of bread that is called "sourdough" has yeast added to it. That's fine, it's still sourdough bread, it is not "pure" sourdough bread. If you are concerned, ask the baker. For recipes using a wheat starter click here. For recipes using a rye starter click here . If you would like to take an introduction to sourdough class to really get your head around the topic, do click here to find a trainer. Too late - I read some of those instructions that say feed every day. I didn't for over a week in the fridge - so down the drain it went. How sad - I'll know for next time. Is white wheat the same as strong white bread flour ? OK I am a man but if you don't ask you don't lean. Hi Carl, that did just make me chuckle! White wheat flour comes in different "strengths". The "strength" refers to the "hardness" or "gluten content". The stronger the flour the stronger the bread. Soft flour is great for cake (soft) and some bread and hard flour is good for other bread. Sadly there is no global or even european standard labelling although you can find comparison tables in Andrew Whitley's book Bread Matters. In general, when making bread you should use the strongest flour you can get which is usually labelled strong or extra strong bread flour. Then again, you may have to trade off between local and strong: In the UK we don't have a lot of really stong flour and a lot of the bread flour that is sold is supplemented with flour from abroad (Canada, US, Turkey, Russia, Khazakstan...) - countries with wide open prairie spaces that produce wonderful, hard flour. So you may have a principle issue with where your food comes from? If you are keen to make bread NOW and you only have regular plain flour - just do it! If, however, you are not so impatient and you can get to a shop, you may want to buy strong bread flour. There is a further level of detail and that is how the flour is milled. For some info on that type "stone milling" into the search bar on the web site. Thank you that as help a great deal, I do live in England and the store and supermarkets have a good range of bread flours, is there any that is better than others ? I also see it may be wise to buy in bulk as the price of grain is going up and up; if I do how long would the flour last ? I know there is a sell by date and I also know you don't always go by that. Hey! There is a fantastic resource on the Traditional Corn Millers' Guild website (TCMG.org.uk) that helps you find wind or water mills near you. If you click here: http://www.brockwell-bake.org.uk/map.php you will find the map and see if there is a mill near you. I buy from Michael Stoate outside Shaftesbury - great flour and bonus that he dlivers in London anyway and so will stop by my house and deliver for free. Flour is heavy - the only downside - so carriage can be expensive. Ask the miller about "use by" dates. The oil in wheat germ does go rancid after a while and I have never had flour long enough to test that. the miller will know. When making a sourdough starter what container do I use? when you say cover it, with what? Can I leave it on the back of the Aga to grow? Great question - and I will change it on the page. You can make it in a plastic box with a tight fitting lid or a bowl with clingfilm on it that you secure with an elastic. You want an air tight container so the sourdough does not dry out. Please don't use a regular glass jar because it may shatter! You can, however, use a kilner jar (the kind with the clip and the rubber seal. When you store it in the fridge, you can store it in the same kind of container you used to make it. As re the aga, I think the back of the aga is too warm. Just pop it on the counter top near the aga or on the floor around the aga but not directly on the aga. I confess I have not tried it on the aga but I do find the aga too warm to proof dough - although somewhere near it is perfect! Thank you for your advice, I just wasn't sure if I covered it tightly as it was growing, I thought it might need the air/bacteria to grow! I guess theres enough air/bacteria in the container for it to feed on. I love sour dough and have been trying to make it for years, and finally I 've found your instructions which are the clearest yet, thank you. I want to make a white spelt starter (like a challenge! ), should I use the same ratio flour to water as a white wheat starter? My son cannot take gluten and would very much like to make some good bread himself: can you tell me whether the sourdough process works with any of the gluten-free flour products? Hi Jane, Sarah T here from school days! Found you on FB and wandered over to your blog. Fantastic! I have always wanted to make my own sourdough. Based on your discussion of hard flours, would typical Canadian All Purpose do? Canadian all purpose will be fine. However if you can find bread flour or hard flour that is even better. We have some of the world's hardest wheat in Manitoba! Alas, not used to make bread by Canadians in the main and much of it exported to, for example, the UK! Hello, I try to make my first sourdough with brown wheat flour. It's 5th day and I cannot see any bubbles. Although it has a sour smell. I am wondering whether I should wait or just start again? Someone told me it is easier with rye flour. any advice, please! if the starter is not bubbling that is a bad sign. You will need to try again. Make sure the water is warm and that the starter is somewhere warm (airing cupboard, heated floor) over the five days. Rye is no more or less easy - you follow the same principles. Serious question: is your house too clean? yeast likes some germs and does not like bleach or disinfectant. I make sour-dough. In making yeast based bread I [believe] I discovered that using milk makes nicer bread. I am now making sour-dough bread with milk and all seems well. Should I worry about leaving a milk based dough for 24 to 48 hours with a bunch of 'bugs'!? I keep doing it and don't get unwell - and I haven't had complaints from my SMALL customer-base! Hi! I hope you can help. The instructions I have for refreshing the rye sourdough starter I keep in the fridge are to mix 10g of it with 60g of wheat flour and 30g of water and leave it for 8 to 12 hours before using it. This normally works fine; but last time (after leaving the paste overnight in the airing cupboard) a pretty solid crust had formed. Is the result useable? and why had it happened? I cannot say why it would suddenly change if it has never done that before. I presume you covered it? What else has changed? the brand of flour, the temp in the cupboard? Hard for me to say.....Is the result useable? Again, I don't know. It's not going to kill you, at worst it is just that IT is dead and the bread won't rise! Give it a try!!! Many thanks for that reply. I usually leave it (as suggested) overnight in the kitchen - maybe the airing cupboard was too much for it. Back to the worktop! Regards, and thanks again. What would recipe be to make a sourdough starter from an existing commercial mix, such as the 75g packet of "Seitenbacher All Natural Ready Sourdough"? When rye sourdough starter is made, can I keep in refrigerator in a closed plastic container (EG, Tupperware)? Do I have to feed the rye sourdough starter every day, after the 4th day of feeding? I have followed your instruction keeping the starter by the boiler in a sealed plastic box- all seemed to good for a couple of days then yesterday it seemed to have split and when i went to feed it today there is a very sour smell and brown water floating on the top. Has something gone wrong? I am using a good quality white bread flour. help please as I really want to try the sourdough hot cross buns. You are doing nothing wrong! It is just that your starter is really active and has gobbled up all the yeast in the flour. However, this does not mean it has "taken" permanently. Just that it's moving fast. Take it away from the boiler and just put it on the counter in the kitchen and feed it as you have been doing for the rest of the time. It's all well!!!! you DON"T need to throw away any of the starter. It's a long discussion about how to KEEP a starter (fridge/no fridge and if no fridge you have to use ALOT or get into the habit of throwing some away for reasons I can bore you with if you are interested) but to MAKE a starter - no need! Over the five days just do equal amounts of wheat and water every day, stir and cover! Promise. It will bubble up by day 2-3 but keep going for the full time. let us know how it goes! Is there any reason why you need different kinds of starter, aside from purity? Could I use a white starter for example in a 100% rye bread for example and, if not, why not? P.S. I loved your tweet about Nelson Mandela and forgiveness. Thank you. Hi Kate, not to worry! There is a lot to take in. Of course you can use a wheat starter and use it - adding wheat, spelt, or rye flour to make your final loaf. However, you need more wheat starter to make (for example) 1 kg of flour "rise" than you do rye starter. The more wheat starter you have, the less rye you use and so you cannot get 100% rye - just having the wheat in with the rye makes it NOT 100%. Does that make sense? You can get closer to 100% wheat using a rye starter simply because you need less of the starter to start with. thanks for the message and I am pleased you like the faux caccia! It's GREAT, isn't it! As re the starter, I am not sure I understand. You took some out and fed the remainder.....why is that? Why not take some out and feed that? Leaving the remainder in the fridge that you did not refresh and putting any refreshed left over back in the container with the leftover. Do let me know. As re using leftover or remainder in your "normal" bread recipe - do it! It's not active so you will need to add yeast, but the sourdough adds flavour and acidity and that's quite nice! Looking forward to hearing from you! I have just made my first sourdough starter but I used rye flour because that is the only organic flour I had in my pantry. I thought I would feed it with strong white. Does it then morph into a starter suitable for white sourdough or wholemeal sourdough. This sourdough business is very confusing! How much of the fifth day white wheat starter is used to make virtuous bread befor the remainder is refrigerated. Conversly what % of starter to flour in the pre-dough and or the final dough. The instructions are to weigh the amount to return to the refrigerator but as the bulk or the stored starter changes the amount to be used for the same recipe will be different. Rob. Dear Rob I do hope I answered this above! Mine stays in the fridge untouched for weeks - and in fact got tarter and tastier after a particularly long (7 weeks) 'break'! I just mix it all up - and fire it off with a feed and use it. Mine (or at least part of mine) had a one year break! It was fine after 2 days of love and food and heat and light! Hi Jane, I am going to trial a spelt sourdough starter (against your best advice, I know - but even sourdough wheat doesn't sit as well in my stomach as spelt does). My question - I have seen spelt starter instructions that say to use OJ instead of water for the first week... why would this be? Is it, as you say above, the acidity will lend itself to a quicker rise? or is it something else entirely. Also, if I use whole meal spelt for a starter, can I make the rest of the bread with white spelt? Or do I have to use whole spelt entirely? Thanks again for a wonderful article. thanks for this. the quthor of the article probably recommends orange juice because it is a bit sweet. Spelt can be very bitter (and it smells so beware!) so OJ will help to sweeten it. if you don't want to use it you don't have to but you may want to sweeten the dough a bit. If you don't want to use honey or molasses try kneading in raisins soaked in hot water over night - they mush right in so you don't notice them. You can change happily between white and whole - don't worry about it at all. You can do the whole thing in one or the other. Treat it exactly as you would a wheat starter. Let me know how you get on! I am unsure what I should be getting using the method you propose for rye SD. I have seen several other recipes that talk of the SD doubling its size during the 3-4 day range (using a removal and discard method as part of the feeding process) and these methods use a 1 to 1 ratio of flour to water. I used your method and after 5 days the solution was filled with small bubbles but had not changed in volume at all. Is this what I should expect to see? I am planning on making Rugbord – well, shall attempt to at any rate! Thanks for the reply. I will start it today, then, and just use water as I have no OJ on hand. I've made plenty of normal bread and some dinner rolls before with spelt flour and I haven't minded the taste at all, so we'll see how this goes. Cheers, Nataliya. I'm so happy to have come across this! I'm just diving into the world of bread-making! I had a couple of epic fails until my DH bought me a bread machine and finally, I can bake a loaf of good bread! But I really want to try making some the old fashioned way! I like feeling like a pioneer woman sometimes! LOL Anyway, today was Day 1 and I mixed 50 g of whole wheat flour and 50 g of warm water together. It's not a lot of water is it? I mixed it up and ended up with a dough - wasn't expecting that... Am I already doing something wrong??? Hi there, that is right! sorry for late reply, hope you are still working on it. Wheat starters are pretty thick. It will settle and separate but don't worry about that! Thank you! Today is Day 3! I stuck with it and when I opened up my container today, I was happy to see that my starter was beginning to change - it can no longer be called dough - it looks like a big gloopy glob. So I think it's working. I can't wait to see if I can bake successfully with it! I am a newbie sourdough enthusiast, and I'm so glad to have found this site. I especially liked the part about how you revived a starter after 5 years in the fridge! I am currently resurrecting two starters: my boyfriend's family's starter, and my own family's starter. They are both around 120-150 years old and the pride of both our clans. Unfortunately, we have not been dutiful dough-keepers, and both starters have been neglected for around 3 years in the fridge. If I wanted to cheat, I could ask our respective family members for replacement starter, but I love a challenge and would like to attempt to bring them back from the dead before throwing in the towel. They have made it this long mold-free, and otherwise look like the day they went in the fridge (plus a little bit of hooch on top). I am in the process of reviving one starter using water and flour in doses recommended by various online sources. I was excited when I noticed action in the starter at about 36 hours. The starter is at 72 hours now and has been rising VERY SLOWLY, and certainly not doubling in volume yet. I have been feeding it every 8-12 hours. I have sampled the starter and it is SOUR. Are these findings consistent with a relative increase in bacteria vs yeast? Am I spoon-feeding a zombie that I should just throw away? How would you suggest nurturing the various microbes already present, while maintaining the originality of the starter? No No!!!! Don't kill it. If anything, take half away (and lob it into some bread that you are making with yeast) and then weigh the remainder. Add same amount of flour and water and leave for 24 hours. Do the same thing (remove half, use it in normal bread, add same amounts, leave 24) and you will see it flourish after a day or two! I'm new to sourdough and have just found your site. So many useful tips! I'm hopeful that my sourdough starter will be ready tomorrow. It's taken a while longer than I expected and have to own up to using a method from a famous baking cookery book. I'm planning to have a second starter on the go and will use your method which seems a lot simpler! Thanks for your comments. I did the water/spoonful of starter test and it's ready! Very excited. Currently doing its first rise and I will do the second one before I go to bed tonight. So excited! Well, it's finally done and tasted. I left it to prove overnight, but when I got up at 8am, it was really overprooved. I did as you suggest here and reshaped it and left it to prove for an hour. It hadn't risen much after an hour, so I went out and left it for another 3 hours and it was ready for baking. Just had my first slice. It was lovely, if a little dense. I'll try to prove another one overnight, but if that's too long a time, then I'm not sure how I can overcome that, as I'm definitely not getting up in the middle of the night to Bake! Hey Cat, That is the perfect idea - just make a bit more starter than you need and put some back. Be careful of your spelt starter: it's really active. I suggest you put it in a BIG tupperware with clippy sides or kilner jar. Spelt starters are really active and you don't want it all over the floor of your fridge. Have fun with it and this is a great question. With just 2 of us in the home and wishing other types of bread, what is the best way to keep a sourdough starter for about a month or two? I tried the fridge, and it grew mold and became black. Going through the multi-day process of starting a new starter for a loaf once a month seems like a lot of work. 2. Was your jar sterilised before you used it? 4. Was the starter viable - ie did you make it over five days? Starter will start to bubble after as little as 2 days but that does not mean they are alive to the extent that they will survive long periods of hibernation. I cannot post photos here but I will post photos on the blog today of my starters so you can see how they are stored and what they look like. After you mix the flour water in stage 1 together at the start and leave it to stand. How important is the temperature of the kitchen as mine varies from freezing on a cold morning to like a sauna when cooking dinner? Does it have to be a consistent room temp? Not really, to be honest, I have done starters all over the place and they pretty much work wherever. There is a lot of myth about temperatures, but they are more robust than you think! I'm finally just finding you as I've been trying to make a starter for a week. I was following instructions that had me making my starter with water, flour and molasses or honey (I had molasses on hand and used that). It seems to get nice and frothy, but I'm wondering if this salvagable or if I need to start all over new? This time, I'll be using your instructions and recipes. I'm finally just finding you as I've been trying to make a starter for a week. I was following instructions that had me making my starter with water, flour and molasses or honey (I had molasses on hand and used that). It seems to get nice and frothy, but I'm wondering if this salvagable or if I need to start all over new? This time, I'll be using your instructions and recipes. Please help! Thanks! Hi there, thanks for this! I would stick to your starter - don't throw it away! Try using it in a recipe and gradually shift over to the method that we use (cheaper! no molasses!). Assume it's a wheat starter? let me know! Hi there, there's a few types of sourdough starters on sales in amazon like san Francisco , alaska starter etc . If i purchase these different kind of starters, will it be the same thing after i fed it in my region? I wonder if i makes the starter at different time of the month , am i getting the same strain of bacteria every time or I could get a stronger one with different type of bacteria. thank you. Dear Jeff, thank you for your comments. Sadly, starters are much more boring than we hope for. The bacteria is a side show, to be honest, the main event is the yeast. The bacteria gets in there when you leave the starter out to build, but when you bake with it, it dies in the oven - most things die at 70 degrees C. If you leave the starter out for too long without feeding and it dies you will have ALL SORTS of nasty bacteria in there that you don't want. So, a live starter has a tiny sub set of yeasts and bacterias. Nothing too exciting I am afraid. You can of course buy one off Amazon but you can also just make your own. By the time the purchased starter gets to you, you will have made your own! Once you start using it, the "original" starter portion is smaller and smaller and smaller.....sorry to disappoint! Hi, I'm trying your method for rye starter and was wondering about how it's meant to smell... Do I need to throw it away if it starts smelling a bit funky on day 3? Some websites talk about "fruity" vs "acidic" smells - I couldn't really describe the way that mine currently smells! I've just buy your Homemade Sourdough Book, and it said to make a sourdough with 140g wheat flour and 240ml of water, why isn't the same recipe that you have in your first book? Thank you for this. Firstly, thank you for buying the books. However, Homemade Sourdough was not written only by me. I was a contributor to that book and all the recipes were written by a different author and edited by a different editorial team. The book is full of errors - so much so that the publishers asked me to completely rewrite the book, which I did. The second book is called "Perfecting Sourdough". If you can, please take back Home Made SOurdough and get a refund (amazon will do that for you if you bought it there. Then, you can buy Perfecting Sourdough which has accurate recipes. Kind regards and I am sorry about that book: the recipes are all awful. Hi, I found this article really useful but every other starter recipe I have seen says to have a loose fitting lid to let gases escape - why do you suggest a tight fitting lid? Sorry if this has been answered. When you make the starter you can use a loose fitting top (plate, bit of plastic) but when you store it you want to use a "clip" tupperware or glass jar. You don't want air to get in or it will dry out in the fridge.